Crispy, savoury, and mint. That’s how it taste. Bánh xèo in English means sizzling cake. 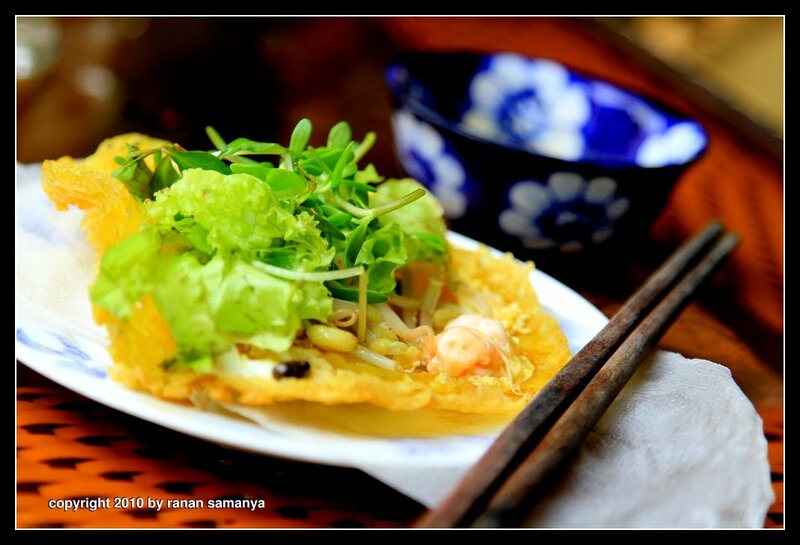 Although it varies from region to region, basically it is a deep fried rice-flour pancake with bean sprouts and a choice of meat (usually pork) or shrimp or both. Top it with lettuce and other fresh crispy greens. Fold it in two, then use the thin rice paper wrapper to wrap around it. Dip it in the dip sauce (another savoury mix of fish sauce, salted soy beans, lime and other exotic ingredients). It is, like I said before: crispy, savoury, and mint. Very tantalizing. Here’s one I ate in one of the cafe in Hoi An’s ancient city.